Last Tuesday, Mother and I decided we didn't have enough going on, so we hopped in the car and drove to San Diego for the WW2 Marine Raiders 75th Anniversary Reunion. We'd only heard about the reunion a few days earlier, and though we had talked about going, we didn't make the decision until about 3pm Tuesday afternoon. By 8pm, we were on the road. Of all the impromptu things I've done, this has to be one of the most rewarding that I can remember. For three days, we received a crash course on the Marine Raiders of WWII, the Guadalcanal and Solomon Islands Campaign, and the brutality of war contrasted with the physical endurance and courage man is capable of enduring. As I write, my head is still spinning from everything we experienced. The Marine Raiders of WWII were a highly trained branch of the Marine Corps who, though only in operation for a little over two years (1942-1944), were very effective in Pacific Theater campaigns. Three of the men to play a significant role in the founding of the Raiders were Col. Merritt Edson, Col. Evans Carlson, and the President's own son, Col. Jimmy Roosevelt. Their goal was to form an elite fighting unit similar to the British Commandos. This fighting force would be able to make quick and efficient guerrilla-type raids on the Japanese-held islands, helping to pave a way for the Army, Navy, and regular Marines. The volunteer Raiders were hand-selected by Edson and Carlson based on the skills they had excelled in during bootcamp. After selection they were sent off for more specialized training. By Summer of '42, they were ready to head out. Edson led the 1st Marines Raider Battalion (Bn), Carlson led the 2nd Bn, Lt Col. Harry B. Liversedge had the 3rd, and Col. Roosevelt the 4th. Under the leadership of these men, the Raiders soon adopted the names "Edson's Raiders" and "Carlson's Raiders." On August 7th, 1942, the 1st Battalion made their landing on the Island of Tulagi, thus opening up the Guadalcanal Islands Campaign. Tulagi resulted in a victory for the Allies, but it was just the start to a long, long war. Early September of '42, was the Battle of Bloody Ridge, or the "Battle of Edson's Ridge." It was a success for the Raiders, but only after a fierce fight. Many of the Raiders we spoke with reckoned back to Bloody Ridge as one of the hardest moments of the war for them. One of them, PFC James Campbell, told us of an incident when he was assigned to watch over the dead and wounded men on part of the Ridge. Right around daybreak, the Japanese, hiding in the trees that overlooked his part of the Ridge and a nearby field, saw him and sent a brisk fire his way. He dove into a foxhole for protection, but unfortunately it wasn't big enough. The fellow who had started to dig the hole had neglected to complete it, leaving it just a bit too short for Campbell's very tall frame. Crouching down and holding his legs to his chest as best as he could, he managed to fit in the hole with just his knees sticking up above ground. "I'm laying there and the bullets [were] hitting all around my knees. That's it." He recalled. "I'm gonna be shipped out of here with a hole in my knees!" At that moment, "An Army fighter plane of all things showed up." said Mr. Campbell, "The Army!" Fitted out with a machine gun, it came over the ridge and spotted the Japanese among the trees. The plane started shredding them with fire, and that was the end of it. Campbell's knees were spared. But it was one of the few times during the war he was sure he was a "goner." The more you read about war, the more potential there is to "get used to it." But I don't think I'll ever get used to seeing grown men break down remembering their lost comrades. It grabs at your heart like few things. I've never been quite so affected as when a tall, strong, brave Marine - trained to endure the toughest fighting and the most grotesque warfare - broke down in tears as he explained to me the mental war he's had to relive for the last 75 years. As I sat at an empty table with him the first morning, he told me story after story from the Battle of Bloody Ridge, scouting patrols that went awry, and friendly fire. At one point, he extended is arms out and said through tears, "I've had men die in my arms! People don't understand. You NEVER get over it." A little while later, a tender-hearted Submariner cried telling us that the worst moment of the entire war for him was preparing 5 Raiders for burial at sea. "Cleaning them, making sure the fluids were out of their bodies, then putting them in the sacks, covering them with the flag... I can't forget it." He said through tears. "We said a prayer and released them." He felt a kinship to these Raiders. 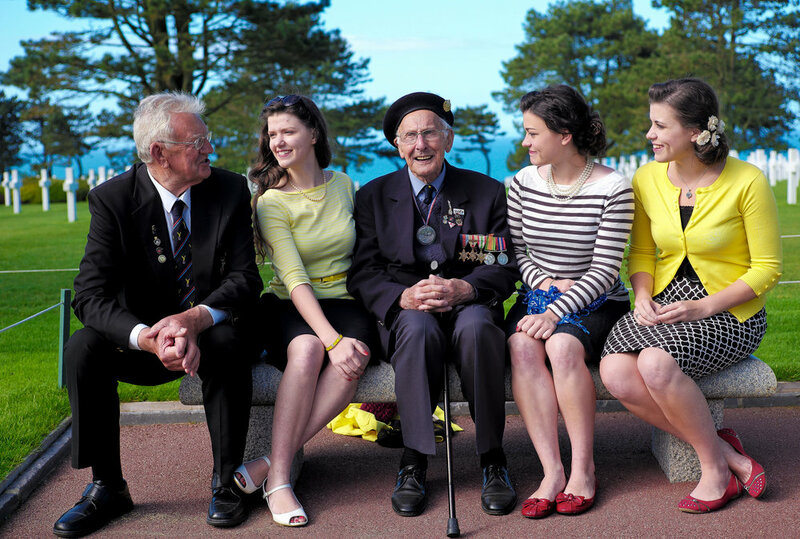 He had delivered them from island to island, and now 75 years later he still felt responsible. He had been only 17. But they were all only 17. Another Raider, one who had survived at Guadalcanal, Bloody Ridge, the Solomons, Guam and all sorts of hell, became very emotional when I asked him about Sugar Loaf (a bloody, bloody battle during the Okinawa Campaign). He said simply, and with great meaning, "We lost so many good men." There was a long pause. "It was terrible." And it had been. He was the sole survivor of his 12-man squad. There are countless stories from this reunion and not all of them are tear-jerkers. One of the most remarkable "miracle" stories I've ever heard was from Raider, Joseph Harrison. During one encounter with the Japanese, Harrison was called on to help carry a stretcher to the field hospital. The man had been hit in the head, but all they could find was an exit wound in the back of his skull. They carried him back and a little while later Harrison learned that the Marine had indeed survived, but the cause of his wound was most curious: - the bullet which had struck him had entered his right eye, circled a less-important part of the brain, and exited through the back of his head. The total long-term consequence was that his vision went from 20/20 to 20/40. Otherwise he was A-Okay. Another similar instance Harrison witnessed happened to his unit's chaplain. During another fight with the Japanese, he saw the chaplain fall to his knees, presumably hit. He rushed up and called for a medic, but when he examined the chaplain he saw that the bullet had only hit the helmet, made a hole, ricocheted around the inside of the helmet, and exited, leaving the chaplain unharmed - though significantly deaf. The chaplain never fully recovered his hearing, but his life had been spared! I asked Mr. Harrison about his return home and the first meal he had. This is a fun one to ask because you hear all sorts of things. I wasn't disappointed. He told me he hadn't had a proper salad or any greens since he had left for the Pacific, 30 months before, so he bought himself several bunches of Celery stocks (made me think of the song, "Celery Stocks at Midnight"), and promptly consumed them. They've been a favorite dish of his ever since. On the drive home, Mom and I talked about the themes of the week. We are still sorting through them all, but here are a few that really stood out to us. The Raiders we talked to seemed to have a deep sense of respect for their officers and an understanding of authority. They saw authority as a good thing and integral to their life, their health, their safety, and the overall success of their mission. 75 years later, and many years older than the highest ranking men around them, they still feel a duty to show the same deference and respect that they would have shown in 1942. Our society today is so egalitarian that a 25 year-old considers himself the peer of a 75 year-old, and often lacks the demonstration of honor to a man, not only his senior in years, but also in wisdom and life experience. I spoke to one Raider who received the Navy Cross and was later commissioned as a 2nd Lieutenant. When Korea came around, he was recalled and sent to the front lines serving as a Rifle Platoon Commander. This position was difficult for him because he did not consider himself an officer. "I never went to Officer Training School," he said. "I didn't know what to do. So I just had to copy what I had seen my officers do in the Pacific." Years later, a Marine Corps General befriended him as a peer, but again the disparity in rank was a challenge. Not because he felt he was less of a Marine, but because he had so much respect for the position and rank of the younger man. The habits and disciplines that you develop early on will stick with you - for better or for worse. Through the intensive training ingrained into them and the brutal combat that the Raiders endured over such a long period of time, many of them were able to excel in later years with a strong work ethic and a general tenacity of spirit. It was inspiring to hear one Raider who, at 93 years old, continues to push and better himself through rigorous athletic training and competitions. A motto of the Raiders states that they are never done being assessed and never done being challenged. Another says, "If you are not moving forward, you have failed." These are not just principles for military combat, they are principles for all of life. There was so much to absorb, and we are still taking it all in and processing what we learned. As long as I can remember, I have wanted to meet a Guadalcanal veteran, and last week I had the honor of meeting 16. It was a tremendous blessing, and I am looking forward greatly to reading and learning more, as we have only scratched the surface.